1 of 3 Melt 3 tablespoons butter in large (5-quart) saucepan over medium-high heat. Add shallots; saute 4 minutes or until softened. Add water and salt; bring to boiling. Add rice and peas; reduce heat to low; simmer, covered, 15 minutes or until rice is tender. 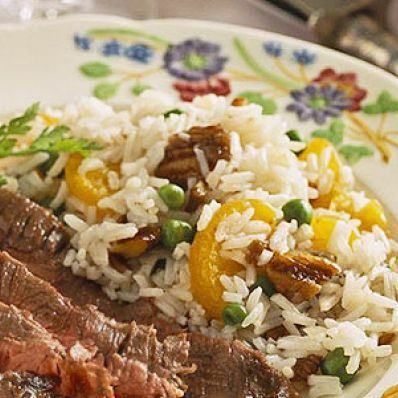 3 of 3 To serve, stir pecans and mandarin oranges into rice. Makes 12 servings. Per Serving: 57 g carb., 6 g pro., 16 mg chol., 13 g Fat, total, 4 g sat. fat, 615 mg sodium, 2 g fiber, 362 kcal cal.